The components page on make/core screams NACIN. While Nacin is a great word when said in a whisper, this is a bit much. The indivudal component pages also ned to be updated. meta-2432.PNG​ (86.6 KB) - added by SergeyBiryukov 2 years ago. Screenshot of the table in the old theme, for reference: meta-2432.PNG​. It also seems like o2 can't handle pages which have the same slug as a CPT archive: Fixed by using verbose page rewrite rules. Breathe: Port the component and Trac report templates across from P2. Those pages are now usable, but are severely ugly. They need a design review. The loop is kind of broken ​on the component pages: both the main one and the individual pages. The welcome message gets replaced / added onto. I also made a couple of commits to improve styling and forgot to reference this ticket:  . The welcome message gets replaced / added onto. 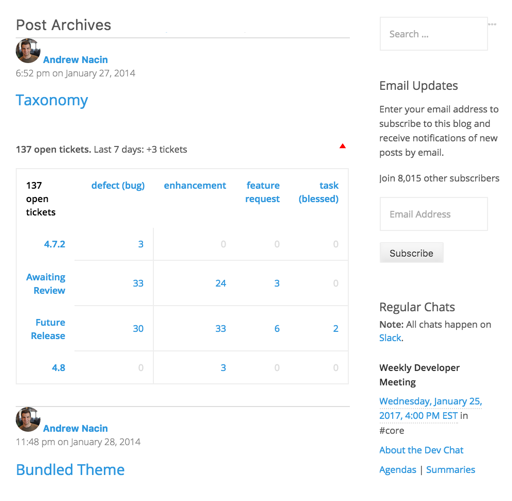 Consider making this a full-width page, with no sidebar. If we do that, we should probably add a widget area to the top right of the page (or somewhere?) that includes information and a "way back" to make/core. I bet some people enter this page via Google or otherwise and could use the pointer. Improve the style of the individual component pages. ​They're ​kind ​of ​meh. 12 months on, nacins face is gone, and bugs deserve their own tickets. Although these pages design is meh, it hasn't changed in 12mths and isn't likely to get a massive update any time soon. I'm going to close this in favour of new tickets and a future iteration of looking at the overall design and reporting of tickets.